When my boys requested oatmeal for the third time last week, I decided to make something new. 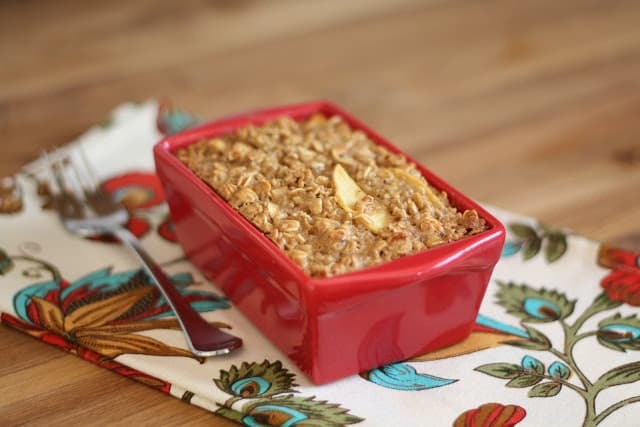 We love our Apple Cinnamon Oatmeal and it is still one of my personal favorites. 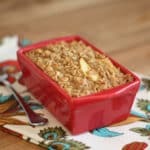 So, this time, I decided to try a baked version of that oatmeal that would really play up the apple pie flavor. The soft apple slices and the tender oats were delicious together. Replacing the oil with applesauce gives the oatmeal a slightly deeper apple flavor. Brown sugar along with a dash or two of holiday spices made this recipe exactly what I wanted. 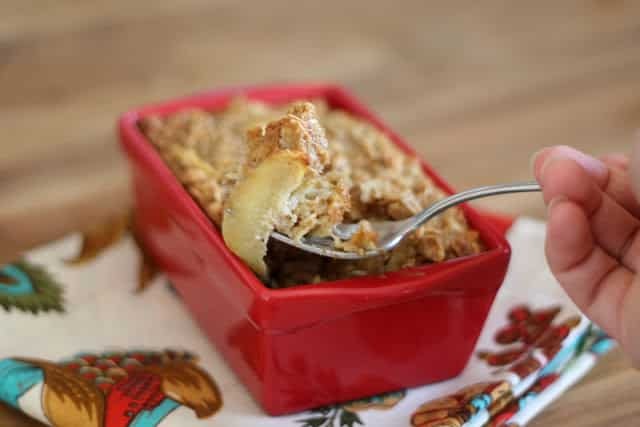 COOK’S NOTE: This oatmeal will hold its shape in slices if you bake it in a 7×9 or 8×8 pan. You can also bake it in a 9×13 pan and it will just be a little bit thinner. If you prefer, it can also be scooped out of the dish and crumbled into each bowl. Remember to adjust the time as needed, depending on the size pan you use. Suggested times are included below. Preheat the oven to 350 degrees. Grease your baking dish very well with butter. Combine all the dry ingredients in a large mixing bowl. Then add the eggs, applesauce and milk, stirring after each addition. Fold in the apple slices. Pour the oatmeal mixture into your baking dish or dishes. Bake a 7x9 pan for about 30 minutes, muffin cups for 20 minutes, deeper ramekins (like the one pictured above) will take about 35 minutes to cook. 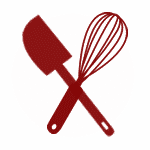 The oatmeal is finished baking when an inserted knife comes out with moist oatmeal crumbs. Let cool for just a few minutes before serving warm. Enjoy! I really need to get on the baked oatmeal bandwagon. I feel like it would make my mornings so much more delicious! The only thing I can think of when I look at this recipe is, wow. This looks like the perfect way to start your day! This is an oatmeal stuffed dessert crumble! Yum!!! This is so cute, it looks like a little oatmeal quick bread. I wonder why I never thought of putting applesauce in my oatmeal to really ramp up the apple flavor! Looks like a great breakfast. Mary, you are a genius :) Love this idea and would eat it morning, noon and night!!! Had one of my sous chefs aka my 9 year old make a double batch of this yesterday and it was awesome the only thing I did different was add an extra 1/2 cuP of brown sugar since I only had plain applesauce on hand. Looks and sounds good! What is the caloric value, fiber, protein, etc? This caught my eye!! Looks delish and will definitely make the hubs happy if I have breakfast for him in the morning :) Thanks, Mary! Hello! If I am tripling this recipe would I really need 6 thinly sliced apples or could I get away with less? Thanks!